2007 the year that was ... Happy 2008 to Everyone! Some memorable moments from 2007 - everyone of them fabulous! I'm adding this second NOW and THEN as a reminder of what must never happen again. Look at what we found ... graves over run with grass and weeds, headstones falling over, no respect, no care. Snakes, rabbits and hares abound, the ants are big enough to carry you off ... distressing. The "Necropolis" at Rookwood, has been on the original site since 1867. Less than 18ks / 11miles from the heart of Sydney, covering 699 acres it's one of the largest burial grounds in the world. Much of the cemetery was laid out like a picturesque park, radiating circles, serpentine paths and scenic locations, using much of the 19th century funerary customs by way of plant symbolism. Parts of it are beautiful. It's all about money, it's political, as the hospital and education systems are in turmoil - how can anyone expect funding to fix a cemetery? Initially the designers never dreamt Sydney's population would explode from when there were basically three major denominations. There's much to contemplate about where we might remain! A passion that occupies lots of my time is family history / genealogy. I've rattled the chains on the skeletons, waded through overgrowth at cemetries, pored over micro fiche and dusty antique records, spent a small fortune on photocopying, travelled to interview darling old relations, asked what some considered were the wrong questions, cried in a local library when unexpectedly, the local studies librarian opened a folder and there was a photo of my grandfather during WWI. I've learnt to never assume. I've collated huge folders on each surname, corresponded with family searchers overseas, got teary when walking the grounds of where my convict, transported ancestor, Mary, lived in horror in Van Diemans Land while her child, Anne, was placed in the Hobart Orphange. Emotionally, I've lurked, marvelling, as Judy Wilkenfield at Red Velvet worked her fingers to the bone creating, Numbers 1 & Numbers 2 a haunting family history installation more touching and amazing than words can describe. ... today Judy announces she is featured in the latest issue of a favourite magazine Cloth Paper & Scissors ... no one is more deserving of this accolade. This stunning book has been on the top of my Amazon Wish List for yonks! Found in Dymocks 50% the RRP - please pass me a lemon to get the smile off my dial ... 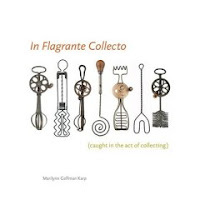 Thank YOU Marilynn Gelfman Karp from a very happy collector! 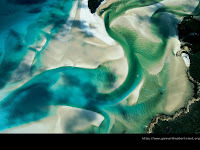 Yann Arthus Bertrand in his breathtaking Earth from Above series of photography! When you see this amazing work surely you'll ponder at the political and media hype about how we, the inhabitants of the world, are "killing" it off! Who's profiting from the hype, from the squillions being spent on summit conferences and big name 'nobs' espousing at what a sorry state the world is in ... are we being fed the facts? OK, OK, slow down, I'm not saying it's all unky dory out there - but please, do yourself a favour, embark on a visual feast, I'm sure you will feel better ... click here to start with Australia ... then choose your destination, it'll cost you nothing! Savouring the flavour with lashings of Brandy Sauce as Dad spooned through his serve looking for a "threepenny or sixpenny bit". Dad gave it the thumbs up reckoning the pudding was one "One of the best!" I didn't tell him how I'd modified Mum's fifty five year old recipe to be gluten free or that I'd included Cranberries ... everyone agreed it was sensaish! Up & Up into the beautiful golden dome, reaching three stories high, is the Christmas Tree inside the stunning Queen Victoria Building, in the heart of Sydney. Lavish 1940s dressing table adorned with gorgeous gifts from that era and others. Ahhhh put your feet up, a fluffy cushion at your back a soft quilt on your lap after the hectic holiday time ... Bliss. Today in the local supermarket I went to buy fresh green beans and saw there was an old fellow hunched over, in front of the beans picking them out of the box, touching them and breaking them in half. I waited a for a second, he saw me watching him as he went to walk away I asked "Did you wash your hands before you touched those beans?" The look on his face was priceless, yet indignantly he started at me in the thickest Euopean accent ... "You are mad, vhat are you talking about, you voman you are mad ... "
Two boys working in the department jumped to my defence telling him to "Rack off mate!" Ahhhhhhhhhh the joys of shopping at Christmas ! "The Optometrist has been & checked my hearing." Presto ... A brilliant invention currently available only in the US!! Send emails and photo's from your computer to people without a computer via the Presto from HP! In December in Australia the temperature often rises to thirty degrees celsius yet many domestic goddess’s still prepare a hot Christmas lunch in the name of ‘tradition.’ Turkey, ham, roast vegetables, sweet green peas with lashings of rich gravy “because that’s what her mother did”, are served as scrumptious Christmas fare. Nowadays more and more Aussies opt for cool, fresh seafood. Despite costing an arm and a leg many a good woman’s sanity is saved. Even more people choose to "go out" for lunch, to restaurants, on cruises, in hotels where people pay through the nose to avoid the drudgery while in reality they're paying the double time wages of the staff … is that why staff are so welcoming? As a kid Christmas lunch was a stuffed roast chicken, roast potato, roast sweet potato, roast pumpkin and green peas or beans. Chicken was a luxury. Dad was the "bread winner"entitling him to be served the white meat while the kids got the “dark meat.” In those days chickens weren’t pumped full of chemicals to keep the meat of the entire bird whiter than white. The breast meat was white, the drumsticks, wings and the rest of the bird was a darker colour … real chicken fed real food. There was no lavish, over the top, razzamataz that goes on today. The kids all played on the street, showing off their ‘new’ bikes, prams, scooters and toys, busting to be first one up and out while still in pyjamas – kids were safe on the street. People were of limited means, credit cards didn’t exist. If you couldn’t afford it or parents couldn’t make it, conjure it up or Mum lay-by it, you didn’t get it. For weeks prior, Dad worked on secret projects down in the shed, his inner sanctum, where we had to knock before entering. I realised in later years Dad must have been painting that bike pink, refurbishing that dolls house, or renovating a found object. Late at night we’d hear Mum pedalling away on the Singer treadle sewing machine, where, if we happened to venture out on the pretext of a glass of water or a bad dream, covers would be thrown over stuff, lights would be hastily switched off depriving us of a glimpse of what was going on! Another childhood memory of this season, a couple of years later was creeping, out late at night, probably unable to sleep with anticipation, and seeing Dad hurl a blanket over two small rattan chairs – I always thought Santa had already been and Dad must have spoken to him, that one baffled me for years. The memories are flooding back – there’s a host of Christmas’ to remember and to forget, see you same time next year for more memories of this season! I have noticed (and on back-checking have confirmed) that Telstra adds 1c rounding to a number of their accounts (not all). A bill today for $120.42 cents to which they rounde 1c making the bill $120.43 - that way they could be receiving 120.45 instead of 120.40. If you multiply that by the number of people in Australia who have a paid for Telstra service it could certainly add a few million dollars a year in Telstra coffers. On a previous bill they added 1 cent to a bill that added up to $89.76, making it $89.77 and therefore raising the bill to $89.80. I phoned to query! Telstra apologised profusely and gave me a credit of $1.00 for any past additions! Makes you think they are aware of the cheating, working on the principle of 'who notices a cent?" Please check your bills ... phone them and complain - get your dollar rebate and let them know that you know Telstra is cheating! The gorgeous B.F. has blown the lid on this Telstra scam!! Sydney - tropical storm - December 2008. Sydney weather has been so bizarre / tropical lately. Afternoon storms brew - like the pics shown here and then they blow over - like this one did Saturday afternoon. Move to the tropics ... no need ... Sydney has it all! ... at the local Scottish Association Ball on a Saturday night in 1960 Moi in silver, Dad handsomely rakeish, Mum in black ... check the gloves! Nights of gay frivolity ... Och aye, Hoot mon! My quest was to discover what a Scotsman wore under his kilt ... on a 'date' with the parents ...NOT! Ze Bew-di-ful girrrls will help you choose the perfect gift and will gift wrap too. Even when it comes to making the Christmas Pud procrastination gets in the way. Should have been made weeks ago but ... better late than never. Today it was created ... first time for ten years ... doesn't it look delish? ... pop back after Christmas and you'll see the flaming pud, on the day, in all it's glory. If I give it to you I'll have to kill you ;~) ho, ho, ho! Writers Island .. "The Moment." The next prompt here on the island will be… “The Moment”. WHICH MOMENT ... ? How can a single moment be "THE MOMENT" ? How about the sad childhood ... that one ??? Or the even sadder teens ... that moment ??? How about the moment when mother caught me wagging school and had my long hair cut into a boyish style ... that one??? How about the joyous moments of giving birth, the euphoria, the elation, the never before felt rapture ... that one??? The falling in and out of love ... ??? All the special occassions relating to my girls "firsts" ... first smile, first step, first drawing, first day at school, first time they said "I love you Mummy" ... those ones ??? The moment when I took a long hard look at myself ... that one ??? Or when someone beloved died ... that one ... ??? The moment of being first published ... that one ??? See ... there's tooooooooo many moments!!! None of my singular moments will fit onto a small page or deserve to be compartmentalised. The moments relevant to this life all count. Whether happy, inherited, hassels, horrid, human, hysterical, humiliating, hazy, hard, haphazard ... they're all part of the big picture, the humongous amount of moments ... that make yours truly ... precisely the same as this very moment!! A game of Trivial Pursuit or Canasta is the best and only competition for me now! Isn’t competition supposed to mean to strive, to achieve, to seek rivalry - don’t you think people have got that out of perspective? Isn’t competition difference, shouldn’t healthy competition go hand in hand with mutual respect? Like when you’re expecting a comment, relevant to what you’ve said or written and you receive a diatribe that’s only relevant to the other person! The people who dismiss your thoughts or contribution as they make it all about them as if your opinion is only a stepping stone to bore you with what’s going on in their own head … that’s infuriating, detestable competition. ... but the very best of all is when you're feeling good inside after you've accomplished, beaten the odds, when the only person you had to compete against was the most important person you know ...YOU! Competition is the rivalry of two or more parties over something. Competition occurs naturally between living organisms which coexist in an environment with limited resources. For example, animals compete over water supplies, food, and mates. In addition, humans compete for attention, wealth, prestige, and fame. … who are those people who said competition is healthy … bah humbug??? If you knew a woman who was pregnant and had 8 kids already - three who were deaf,two who were blind, one mentally retarded - and she had Syphillis, would you recommendthat she have an abortion? Candidate A. Associates with crooked politicians, and consults with astrologists. He's had two mistresses. He also chain smokes and drinks 8 to 10 martinis a day. Candidate B. He was kicked out of office twice, sleeps until noon, used opium in college and drinks a quart of whiskey every evening. Candidate C. He is a decorated war hero. He's a vegetarian, doesn't smoke, drinks an occasionalbeer and never cheated on his wife. On your answer to the abortion question: If you said YES, you just killed Beethoven. Should make a person think before judging another. When I recall all the naffs that have broken promises to me ... subject closed!!! 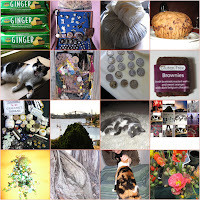 so many gift ideas ...a special English, vintage cup, saucer and plate from $25.00, modern magnets with a vintage look and message, glorious glass bottles, a mirror based lamp swathed in green muted silk chiffon ... luscious!! I'm sure I heard Blossom purrrrrr ... I'm OVER IT !!! A pic from an episode of Blue Heelers or an Australian IDOL audition you ask ??? NOooooo ... it's too many police officers shirking the beat whilst under the guise of The NSW Police Band performing at a Sydney suburban street fair today. No wonder we wait so long for police to answer a call ... too many are at band practice. What a rort. ... join the cops to fight crime, end up in a rock 'n'roll band, receive a cops wage ... how good is that !!!! What an outrageous use of resources ... police salaries, instruments, chairs, music stands, sound equipment, sound engineers, huge trucks to carry the equipment, buses to transport the 'band' ... and the band plays on while crime and fear rages ...???????? Poetry or Stream of Consciousness??? 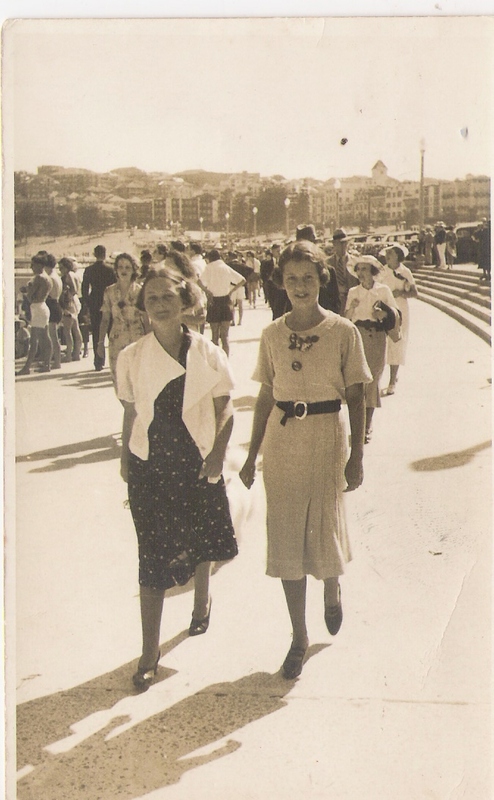 A stroll along the promenade at Bondi Beach was THE place for young ladies to be seen on a warm Sunday afternoon in 1938. Mum with her friend Coralie Martin, two fashionable 17 year olds in uncomplicated times. A walk, a stroll, an amble on the prom was a pleasure, entertainment ... look at what we don't appreciate anymore, the simple joys of life, gone!